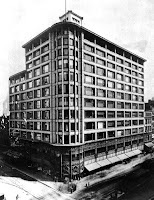 At the turn of the 20th centuy it appeared in Chicago a group of architects who developed an architectonical style that is known as the Chicago School or Commercial style. They promoted new technologies of steel-frame construction and developed a spatial aesthetic that became very influential. It is contemporary of the European Modernism. Some of the distinguish features of the C hicago School are the use of steel-frame buildings with masonry cladding (terra cotta), allowing large plate-glass window areas and the use of limited amounts of exterior ornament. Sometimes they used elements of neoclassical architecture for their skyscrapers. In many of them classical columns can be found. The scheme of the buildings is normally: a first floor functions as the base, middle storeis with little ornamental detail, that act as the shaft of the column, and the last floor that represent the capital, with more ornamental detail and ended with a cornice. The Chicago window is a creation of this school. It is a three-part window consisting of a large fixed centre panel flanked by two smaller double-hung sash windows. The arrangement of windows on the façade typically created a grid pattern, with some projecting out from the façade forming bay windows. These windows combine the need for light-gathering and the need for natural ventilation; the single central pane was usually fixed, while the two surrounding panes were operable. Some architects of this school are Louis Sullivan, Richardson, Adler. Other architects who collaborated with them or worked in a similar style were Frank Lloyd Wright and Mies van der Rohe. 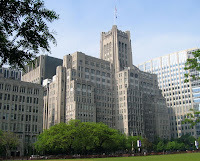 Examples of this architectural style are Chicago’s Auditorium Building, Carson Company Building, Reliance Building.